Explore the spectacular high-country geology of one of America's most scenic roads! 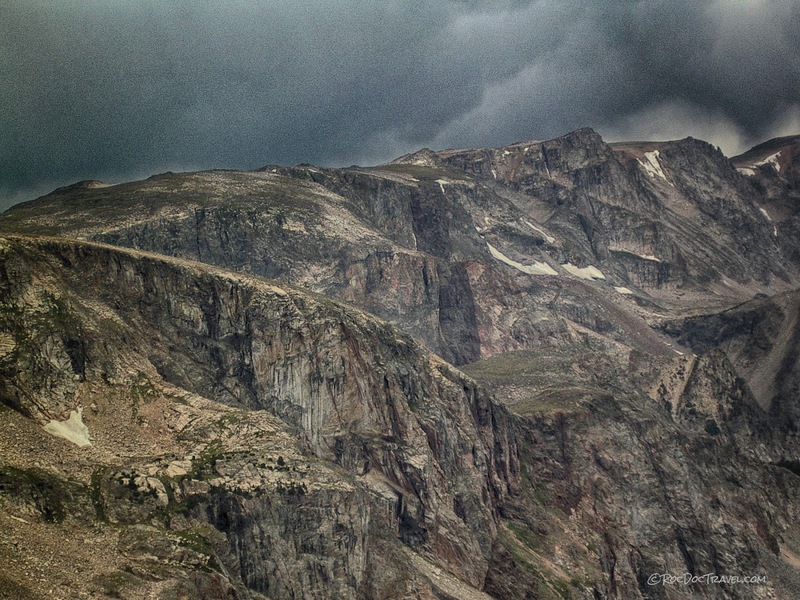 Why Drive the Beartooth Highway? This is the road that put the "high" in highway! Always on the list of most scenic roads, the Beartooth Highway takes you all the way to 11,000 feet (3350 m) on good pavement. The only drama is the scenery - the road itself won't stress you or your vehicle like some others, but the twisties are enough to make the most of your sportscar or motorcycle. Location: On the Wyoming-Montana border, just NE of Yellowstone National Park. That's northwestern Wyoming and south-central Montana. Lodging: Most travelers stay in Red Lodge, Montana; another smaller option is Silver Gate - Cook City, Wyoming near Yellowstone's NE entrance. Vehicles: Even RV's take this incredible mountain road, but BE SURE your brakes, fuel, and cooling systems are in top condition. The pavement is good, suitable even for sportscars and motorcycles. Logistics: There are no commercial facilities along most of the road, so this is a good picnic trip. Some food is available at Top of the World (see below). Fill up your tank before you go! Camping: Campgrounds are numerous on the north side along Rock Creek. Two large campgrounds are located at Beartooth Lake and Island Lake. More are located on the south side along Clark Fork River in Shoshone National Forest. Accessibility: One of the great things about this trip is its accessibility to anyone with a vehicle. Hiking, Backpacking, Exploring: This is paradise! Check the Forest Service website or the Beartooth Recreational Trails Association. Many other websites have information on these fantastic, endless trails. The tour here starts on the south side of the range and goes up to the summit. 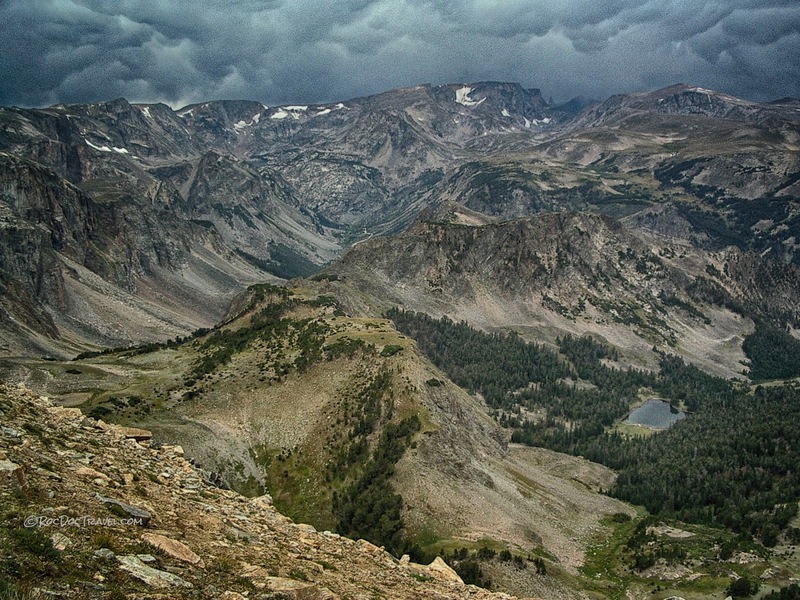 The Beartooth Mountains are one of the big crustal uplifts that formed the Rocky Mountains between about 70 and 40 million years ago. As this diagram shows, it is a thick block of crust uplifted above a thrust fault. This was all caused by the ancestral Pacific tectonic plate dragging under western North America, causing compression of the crust. Shallower sedimentary rock layers were eroded while the block was being uplifted. As this map shows, the Beartooths are one of many related mountain ranges that comprise the Rockies in southern Montana, all of Wyoming, most of Colorado, and north-central New Mexico. 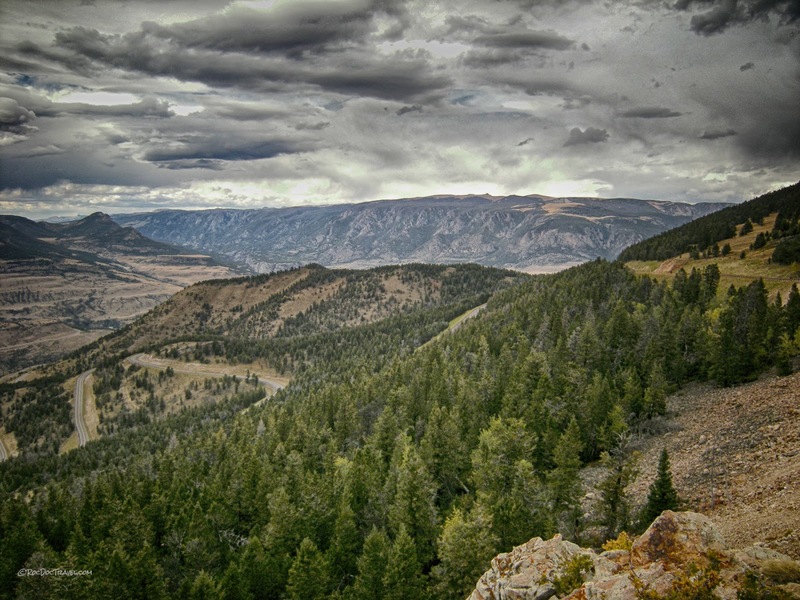 The ranges in and around Wyoming share a lot of visual characteristics, including the Beartooths, Bighorns, Wind Rivers, Rattlesnake Mountain, the Laramie Range, and the Medicine Bow mountains. They're all wide, blocky uplifts cored by old (Precambrian) granite and metamorphic rocks, with sedimentary rocks tilted on one side of the range and steeply folded on the other. 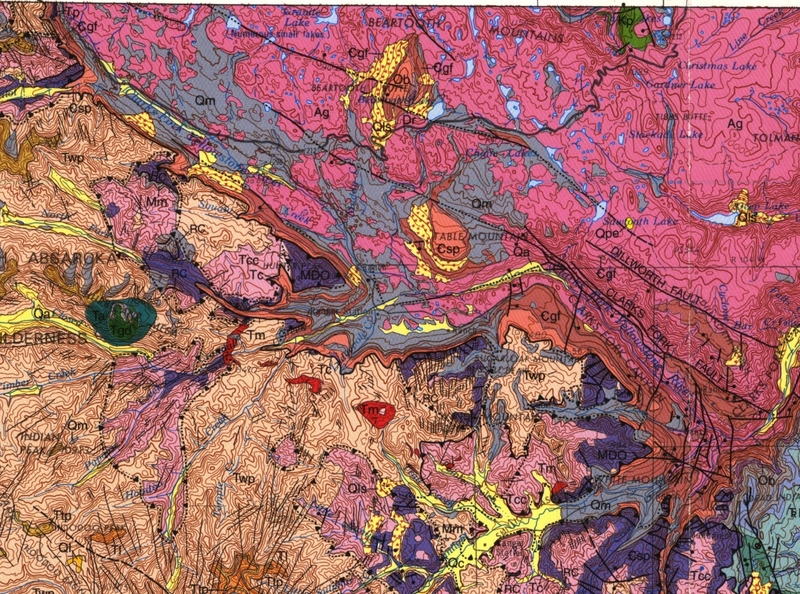 The Beartooth Highway is the dark squiggly line across the top center of this geologic map. The pink is the Precambrian granite and metamorphic rocks of the southern Beartooth Mountains. They were metamorphosed in a great mountain-building event about 2.8 billion years ago. At that time, the pieces that would later be assembled into the North American continent existed as separate continents, separated by ocean basins. 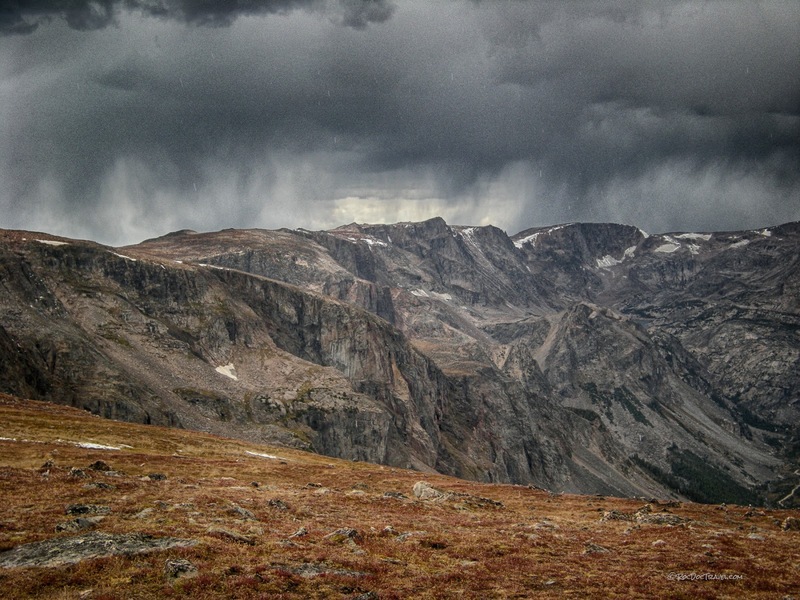 The rocks we see in the Beartooth Mountains are some of the oldest roots of the continental core. 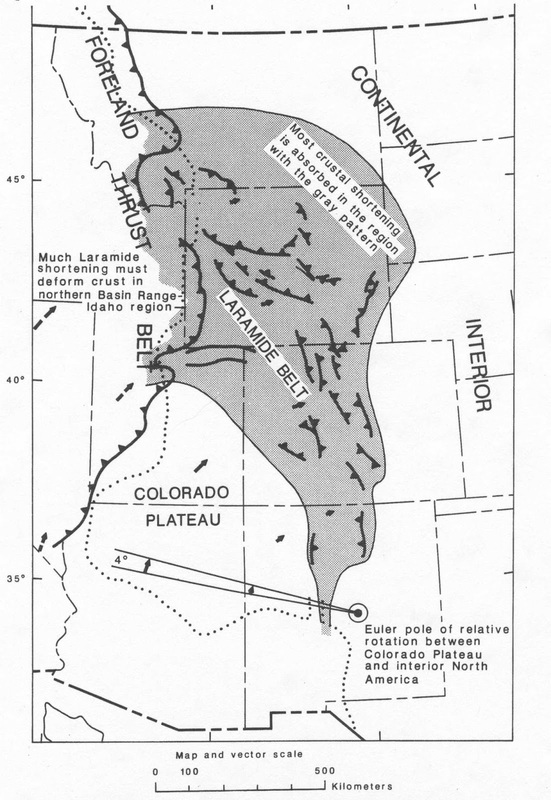 They are part of the "Wyoming craton" (craton means continental core) that is exposed in the "Laramide" Rocky Mountain uplifts throughout Wyoming and southern Montana. Sedimentary rocks (all <0.5 billion years old) are the other colors, and volcanic rocks are the browns south of the Beartooths in the Absaroka Wilderness and Yellowstone National Park. The oldest of these rocks were deposited on the old granite - metamorphic roots only long after North America was assembled. Just a couple of miles up the highway is a scenic turn-out with an outhouse. It's not labeled, but it ought to be called the Clark Fork Overlook. From there you get a stunning 180 degree view of Clark Fork Canyon. Looking to the west back toward Yellowstone, you see Pilot Peak (the point; 11,699 feet) and Index Peak (11,250 feet) to its right. They are made of volcanic rocks about 45 million years old -- much older than the Yellowstone hot spot. In other words, the Yellowstone volcanics have cut into a huge volcanic field that was already there! The most noticeable difference is color - the older rocks are darker andesite that tends to be shades of brown and gray with reddish tones, where Yellowstone's lighter rhyolite and basalt tend to be pastels (rhyolite) or dark gray to rusty red (basalt). The older volcanic rocks are called the Absaroka Volcanics, and they make up most of the Absaroka wilderness east of Yellowstone. Much of the volume of these rocks is conglomerate - hardened gravel and flash flood deposits that came roaring down the flanks of the Absaroka volcanoes. You can see these conglomerates clearly along the NE entrance road and between the east entrance and Cody, Wyoming. This is a view of the Beartooth uplift from the southeast at Dead Indian Hill (awful name, I know), showing the blocky, flat-topped shape of the uplift. The flat surface roughly follows the "Great Unconformity," which is the two billion year gap between Precambrian and Cambrian rocks. Erosion has cut into it quite a bit by removing the more easily eroded sedimentary rocks, but you can still see that a big, thick, old section of Earth's crust has been uplifted and eroded off here. Looking south from the Clark Fork overlook, do you see the continuous off-white cliff? That's the Bighorn Dolomite, a 470 million year old seafloor deposit that blankets this region. The top of it is the base of one of Earth's biggest landslides - the Heart Mountain Detachment. From this viewpoint you can see that the rocks on top of the Bighorn vary from place to place - dark Absaroka volcanics, lighter cliff-forming limestone, and others. That's because the rocks above the Bighorn are a giant landslide that broke into big pieces as it slid. The landslide extends from here to Cody, Wyoming, a distance of over 40 miles (65 km). Exactly how and why it slid is still debated - volcanic influence? High pore pressure? - but the basic idea is that the rock layers slid south to southeastward off the rising Beartooth uplift. The layers slid out into the Bighorn Basin near Cody, right across the surface of the earth. A prominent remnant there is the landslide's namesake, Heart Mountain. Just another view of Pilot Peak, because it's so beautiful! This is a panorama from the Clay Butte fire lookout, southward across Clark Fork Canyon to the Absaroka Wilderness. You can just pick out the nearly horizontal Bighorn Dolomite that marks the base of the Heart Mountain Detachment. Beartooth Butte as seen from the Clay Butte fire lookout. Clay Butte and Beartooth Butte are remnants of the sedimentary rock layers that used to cover all of the Beartooths. These were neither eroded away nor slid in the giant landslide. The yellow color is hydrothermal alteration, which is pretty common in this region with all the past volcanic activity. Hot water dissolves minerals, changing the color and texture of the rock. I recommend the lookout! The road up is well graded and passable for any vehicle but sports cars. Be careful after heavy rains. View of Pilot Peak from Clay Butte. Looking west from the Clay Butte fire lookout, you can see how extensive the Beartooth Mountains are. Most of it is wilderness both in legal designation and nature. View to the southeast of eastern Clark Fork Canyon from Clay Butte. 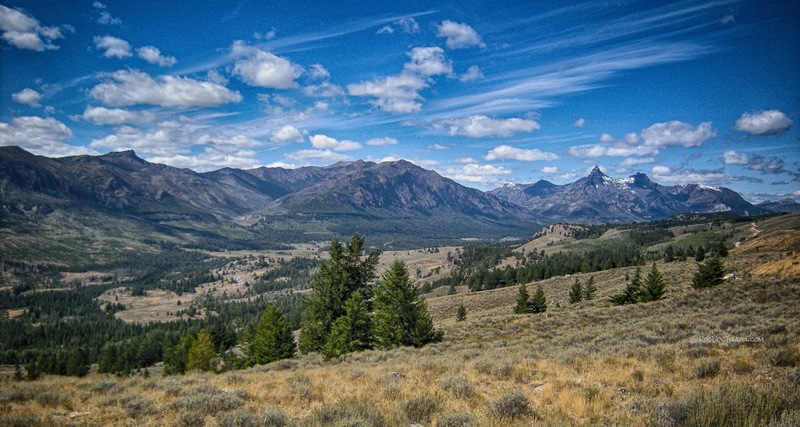 Panorama of Clark Fork Canyon from Clay Butte. View to the west from the Clay Butte road, showing the long Beartooth Mountain range. Clay Butte still contains some of the sedimentary rock layers near its top. They are remnants of the layers that once blanketed the granite and metamorphic rocks, but have mostly been eroded away or slid on the Heart Mountain Detachment landslide. This highway is a favorite for driving and cycling enthusiasts from all over. It has uniquely spectacular scenery and plenty of curves, so expect to share the road with motorcycle clubs, sportscar clubs, and driving enthusiasts of all kinds! Beartooth Butte peaking over the forest along Beartooth Highway. The imaginatively named Beartooth Falls are visible from the highway above the Clay Butte lookout turnoff. The road at Beartooth Falls. One of my favorite spots to stop and relax is Beartooth Lake. It's colorful, clear and calm, and never crowded. The "Top of the World" store is one of the only outposts of "civilization" along the Beartooth Highway. 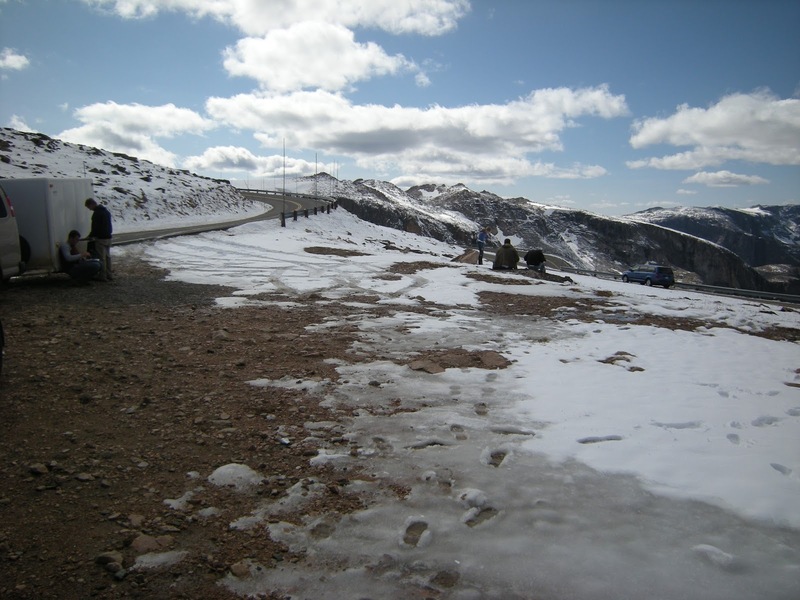 At elevation of 9350 feet (2850 m), it has a short season. Above "top of the world," you'll see evidence of glaciation in these "roche moutonnee," or "rock sheep." Ice dragged over these small bedrock mounds, removing loose rocks and smoothing the bedrock into elongate shapes like sleeping sheep. Just a bit farther up is a turnoff to Island Lake (the lakes here don't have very creative names) and its campground. Lakes in the Beartooth Mountains occupy low spots where glaciers plucked out and carried away fractured bedrock, creating the depressions. You're drooling right now if you're a sportscar driver like me! You'll see quite a variety of textures and some colors in the bedrock, like the orangey alteration here. That's from the flow of hot water long ago. Here's a panorama of Long Lake (again, no creativity! ), another favorite spot to stop, hike, relax, and meditate. If you look carefully, you can see how the bedrock was plucked, smoothed, and shaped by glaciers in the past. From Long Lake you can see the top of the range. That's where you're going! The highway crosses the outlet creek from Long Lake on its south end. A mile up from Long Lake, look westward for the black dike. See it in the center of this picture? About two billion years after the bedrock was metamorphosed, a big volcanic event injected dark magma (gabbro) into crustal fractures throughout this region. The most famous of these dikes is in Mt. Moran in the Teton Range, and similar dikes of various ages are found from Montana to Arizona. You'll see more in the Beartooths. This highway doesn't open until the road crews can dig it out in the summer! Look how high the "drift cutters" are on this rotary plow! They're the steel bars standing up from its sides, and they show you the depth of snow they expect to encounter in late June to mid July. Looking back down at Long Lake from higher on the road. Above Long Lake, the road gets a little steeper and has many switchbacks. These give good opportunity to look at the bedrock, so take advantage (unless you're the driver!). Turn-outs are few, so be careful and don't stop on the pavement. You'll see banded gneiss, characterized by light and dark layers that are often folded into wonderful squiggles and parabolas, and granite dikes cutting across the banding. Above timberline, about 9900 feet (about 3020 m) here the terrain opens up. Welcome to ice cap country! This is where glaciers weren't in indivudual valley glaciers, but in a thick, continuous cap atop the mountain range. You can still see ice caps in northern Banff and in Jasper National Park in Canada (see field trip here). All loose rocks, boulders, and gravel you see here are post-ice age. The summit of the highway is at top-center in this photo. Most vehicles lose power noticeably at this elevation, except turbodiesel motors like my camper. At the first big 180 turn, park your car and walk to the crest to look over the north side. 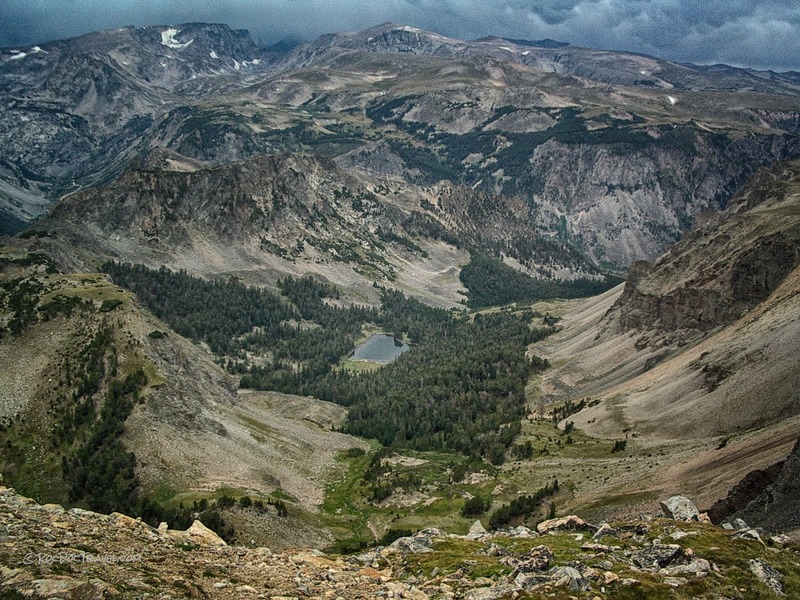 You're at the top of a cirque, which is the semicircular head of a glaciated valley. 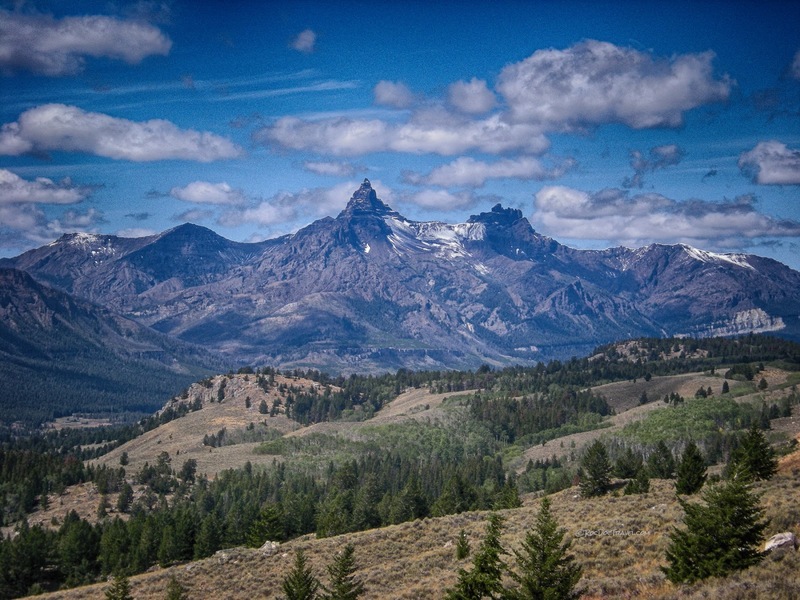 This view shows the distinctively flat top of the range and the deep, extensive U-shaped glacial valleys that characterize the north side of the range. This is the first 180 degree turn where you can park and walk up. Have a look at the banded gneiss. These started out as granites, but have been subjected to such deep burial, high pressure, high temperature, and billions of years that their minerals have changed and they have stretched, sheared, and flowed, into these wonderful shapes -- all in the solid state, without melting! The rocks include amphibolite and granulite facies metamorphism (for the rock nerds in the audience). View from the cirque top toward the west and the high Beartooths. All of the canyons and lakes you can see are there because of glaciers, some of which were more than 2000 feet (610 m) thick. The ice cap atop the range fed the valley glaciers from above. Here's a fisheye view down on the highway. View from the next 180-degree turn back toward the first. I wonder why there's no "Beartooth Hillclimb" race like the ones at Pike's Peak and elsewhere? This highway would be perfect for a race on both the north and south sides. Welcome to the real top of the world! There's a nice turnout and parking area at the summit, with unbeatable views to the north and south. This is what happens when I take field trips here in September! Just beyond (north of) the summit, you'll see several small turn-outs that have spectacular views like this. The spike in the skyline is the bear's tooth from which the mountains get their name. It is a "horn" like the famous Matterhorn in the Alps - a narrow peak carved on all sides by the action of glaciers. The stick in the lower part of the photo is a snow marker for the road. The long, deep, U-shaped canyon is Rock Creek Canyon, which was carved by a half-mile thick glacier during the last ice ages. About 90% of the past 2 million years were in ice age. This fact has profound impact on the landscape we see north of 40 degrees latitude (about central California, Utah, Colorado, Ohio, West Virginia and northward). We live in a largely ice age landscape! Rivers occupy valleys much too big for their flow. Mountains have U-shaped valleys, cirques, and horns. Evidence of giant floods blankets eastern Washington (field trip coming soon). Enormous piles and blankets of gravel cover the upper Midwest. 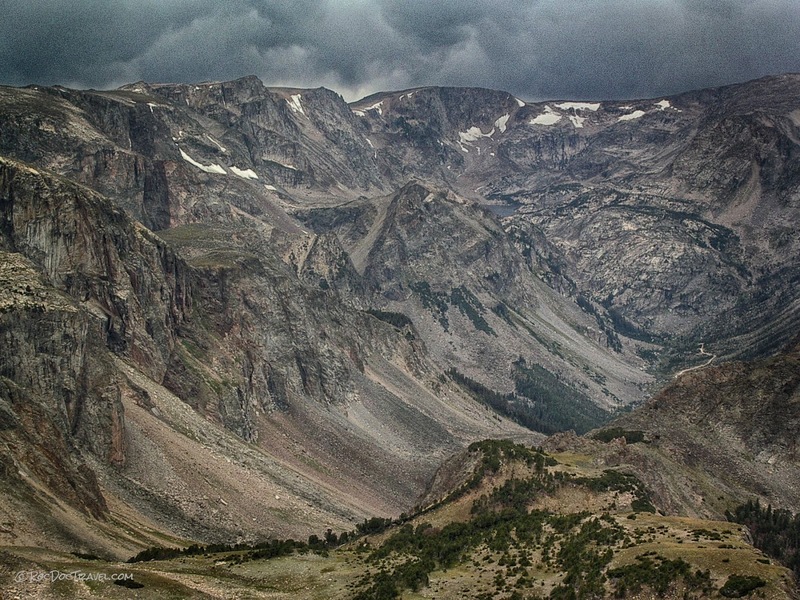 That ice age legacy is nowhere more clear than here in the Beartooth Mountains of southern Montana. From the same turn-out as above you can see another black dike cutting across the mountains. Looking down more than 3000 feet (915 m) into Rock Creek Canyon and higher side canyons in the foreground. Ever wonder how fast mountains erode? This photo gives a clue. See the gravel slopes below the cliffs? Those are alluvial (gravel) fans, and they all formed after the valley glacier melted away about 12,000 years ago. So, those millions of cubic yards of gravel formed in that amount of time, having been removed by ice wedging and flash floods from the cliffs and canyons above. Now you can do the math. 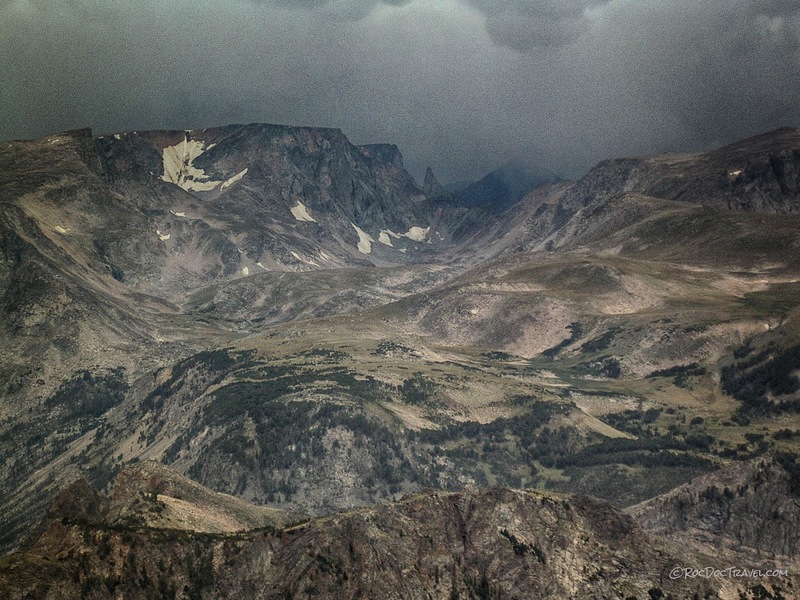 The Bear's Tooth (11,920 feet, 3,630 m) presides over the mountain wilderness. A parting view of the high Beartooth Mountains from the highway. You're looking at the old rock roots of North America! 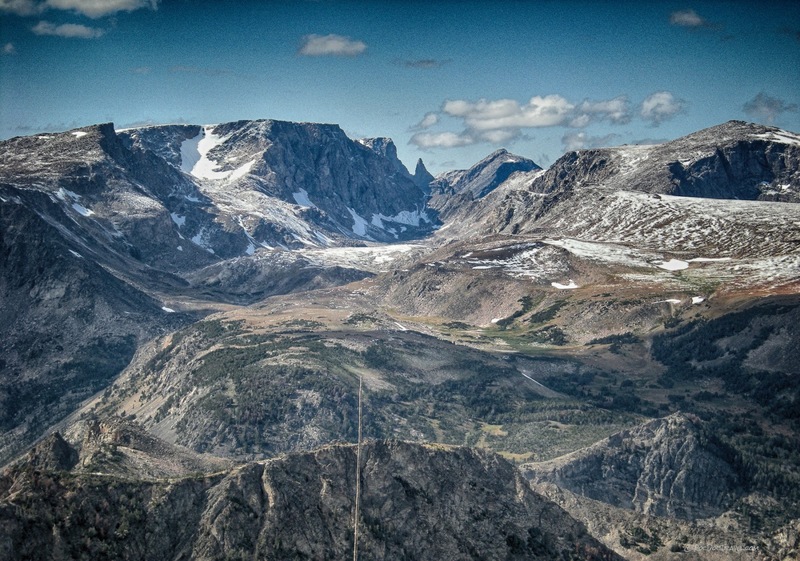 Next Field Trip: Beartooth Highway Part 2 - the north side. Yes, the earth is very, very old. Just contemplate the metamorphism, uplift, glaciation, and erosion you see here, and you can arrive at no other conclusion.